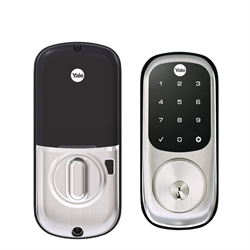 Never worry about if you have your keys again with the Yale Assure touchscreen lock. It comes with the connected by August kit that lets you unlock, share access and check who comes and goes all using the August app. The app allows you to assign secure virtual keys to friends, family or service providers which can be either permanent or temporary. You can set expiry times for codes which will automatically delete them from the system, so you don’t have to worry about them once the time is up. Just set it and forget it. If your phone dies, you can use the sleek backlit touchscreen keypad to enter your code or use one of the keys which comes with it.